Trying new techniques on a couple of quilts for this great project. These are the kind of easter eggs I made growing up. They're called pysanka and they're a traditional Ukranian art form. I'm an only child and my mom was mostly at home with me when I was growing up, so I got to do a lot of stuff that would have been too difficult with more kids. These eggs were one of those things. You make them by carefully applying wax from a stylus, which you hold over a flame to heat. When you apply the wax it masks off the area it covers so that part won't dye any more. You move from the lightest color to the darkest and then at the end you carefully hold the egg by a flame and melt off all the wax to reveal the design. Today was a remarkably unproductive day as far as making the necessary revisions to my thesis. I procrastinated by watching the latest episode of Mythbusters and making a protective sleeve for my laptop. The fabric is from the Legacy Studio Fresh Fusion line and I love love love it. I already made myself a pillow case out of the same fabric and went back to buy more, plus coordinates. The laptop case is a tight squeeze, but it fits. I'm using over-all snaps to make a removable shoulder strap (not attached in the picture.) All in all, it was a successful, academically-unproductive day. A completed draft of the thesis is done and my poster presentation session was this morning so I did some celebratory sewing this afternoon. I am still cutting 2.5" squares out of every mostly-solid-colored fabric I can find. In the process I kind of went nuts on my stash. There were fabric piles on every surface. I cut a lot of selvages off and they are heading off tomorrow to Jacquie who recently made a stunning selvage quilt. I have 73 squares cut. I strip pieced them all onto the white fabric and pressed them flat with my mini iron. Even though I still need 27 squares, equivalent to one whole side of the border, I had to array them and put them up to see how it looks so far. There are a lot of placement problems to solve, but I think I like the way it looks. At first I wasn't sure. 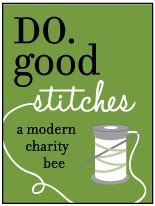 Maybe a thin dark border to separate the center from the border? I'm not sure. I also did my first paper piecing today - those circling geese you see at the top of the wall. There were 8 goose and 12 goose varieties of that block. I decided to start with the 8 goose block, which I think was a pretty wise choice. That one is done in some scraps as a learning piece, but I have plans to make quite a few of them to go with the striped diamond blocks. I'll give you a hint, I'm calling it "Kites and Geese" for now. When I start to get the itch for a particular design idea I go looking for pictures that inspire me. The 'quilts' file on my computer contains nearly 400 photos. I have 20 photos of various bargello quilts, for instance. Right now I'm still stuck on middle eastern designs. 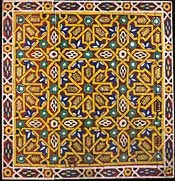 Today while waiting for my research poster to print I spent an hour and a half searching for more images (see my first post) of Arabic architecture and decoration. The geometric designs appeal to me most, but the intricate, swirling floral designs are a close second. I'd give anything to be able to quilt like that. I think it would be the most beautiful, dense, artistic quilting I can imagine. This particular line design, with the stars, seems to be very very common in various iterations. There are versions with six pointed stars, eight pointed stars, and even more. Some have hexagons in the negative space and some have 5 pointed stars. I'm completely fascinated by the complexity and the variety. This is definitely something I'll be experimenting with in my quilting. Since it's all straight lines I know I can do it with a ruler and fabric marking pencil. 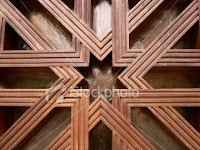 I would like to make quilt patterns based on these type of wood panel designs. I had expected that someone would have done it already, but for the life of me I can't find it! Last night I finally found one picture that appears to be a variation of the same stars pattern, but it's only of a portion of the quilt and I haven't been able to find anymore. Still, it's extremely helpful to see how it might be done. I'm not sure how or when these designs will be realized in actual quilts, but it's definitely going to happen. Until recently, if you'd asked me I would have told you that I'm not really a "color" person. I prefer browns and neutrals, in fact the only color I really am drawn to is blue. Nearly everything I own is blue - which can make coordinating outfits a problem. So, I don't know what the deal is, but scrap quilts seem to be bringing out my colorful side. First there was the whirligig quilt and now this rainbow string quilt. Strangely enough, I'm really loving the color! I've been stitching on this whenever I got stuck on my thesis. I had the idea to sash it the other day and I definitely think it was the right choice. It's not done yet - I think the border is really going to put this one over the top. Before I can make it I have to cut a 2.5" square out of every fabric I own, no repeats! I think I need about 100 different squares. This is going to be a gift to my scholarship donors. I had another larger, in my opinion much nicer quilt for them nearly finished when it ended in a tragic quilt-tastrophe which I will tell you about another time. I hadn't been able to summon up the will to make another for them, but time is getting short and I think they'll enjoy this one almost as well. On the home front, the thesis is coming along. Most of the hard work is done, whoohoo! I feel pretty awful today. The blood work indicated that my ferritin was low so I am taking a high dose of iron supplement. I had been taking an antibiotic for my cold but last night I started having a bizarre and painful reaction to it (at least let's hope the nurse was right and that's what caused it, otherwise I'll be heading to the urgent care clinic). So no more antibiotics; my stuffy nose and achy head linger on. Ew. I had grand plans for my days off from school. Unfortunately, an unforeseen sore throat and cold sabotaged my plans and I barely managed to get the monster basted today before I have to head back to school tomorrow. I'm going to be in full-swing thesis-finishing mode for the next couple weeks. I really need to have it done on Tuesday. As in 7 days from now. Geez. I went to the doctor this morning to try and get some answers. I get one cold on top of another, and even when I'm in between sicknesses I often have day-long spells of lethargy, full-body muscle ache, and stale head aches. The doctor said "Yeah, unfortunately that's kind of normal for people your age." Really?! Because I live with a bunch of people my age and none of them are nearly as sick as me. Anyway, they ran a blood panel so maybe that will come back with an explanation. 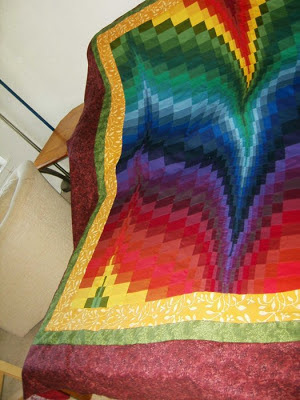 The bargello quilt won't be going back with me since there's no way I can quilt it there. I wanted to get in a trial run, but didn't, so I'm still not sure if I'll be able to quilt it at all. That remains to be seen. I basted it the way I've done the past couple pf quilts: by pushing back my parents living room furniture and rolling up the rug. I tape the quilt back (right side down) to the floor and then add the batting and top. I pinned it moving in rows from one side to the other. I rationed my pins because I was afraid I would run out and ended up with leftovers. The pinning isn't as dense as I usually use, but I think it'll be okay. I may post some more older projects, but there should be no more new progress on the sewing front until I dig myself out of thesis hell sometime next week. 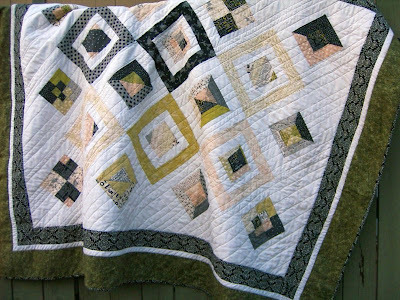 Today I'm featuring another old quilt. This was technically my first finish of 2010. I finished quilting it at my parents' house just after Christmas, taking advantage of their big dining room table to quilt it. It's made from the scraps left from the Authentic throw. That quilt was made by sewing jelly roll strips together in sets of four and cutting squares on point out of them. That generated a ton of triangles made up of little slices of jelly roll. I put those triangles back together into squares. The smaller squares I bordered with muslin and the whole jelly roll strips I had left. The LOVE the muslin I used in these two quilts. I'm out of it at the moment, unfortunately. It is natural, offwhite color with some imperfections and it paired so perfectly with the Authentic line. I also really love the black and cream fabric in the inner border and the binding. I think it's the simplicity of the color scheme with the ornate pattern that makes me like it so much. I have just a little of it left. The outter border is a leafy dark green batik that's another favorite. I quilted it with diagonal lines at varying distances apart. The batting is Warm & Natural and it's really quite heavy, especially for this part of the country. This is the quilt the is on my bed, it's about large twin-size but works well on my full-size bed. It feels the most "me" of the quilts I've made. It's simple and the colors are subdued and the design grew easily from the scraps I couldn't bear to waste. Meanwhile, there is a rainbow string quilt coming together on the design wall while the squares quilt waits for motivation to return. The bargello top is finished! After seeing how large it is (about 90" square), I'm going to be pricing long arm quilters in the area later this afternoon. I'm happy with how the borders came out and I love the curves in the quilt; they remind me so much of the designs in traditional Arabic architecture. It's quite a bit darker in real life than it has been appearing in pictures. The photo below shows the colors (and the size!) most accurately. I can't believe how easy this was to piece for such great visual impact. I think there is a misconception that bargellos are difficult. That being said, would anyone be interested in a tutorial or even a pattern for this type of quilt? The bargello top is now completed with borders sewn on. It looks exactly like I hoped and is larger than I imagined. I'll take some pictures for you tomorrow with decent light (hopefully). In the meanwhile, I'm getting on the "studio" bandwagon and posting pictures of my workspace for your amusement. I'm a student and I have roommates, so my "studio" is also my bedroom, office, dining room... you get the picture. The photo above shows the main workspace. The left "L" of the desk is for sewing and fabric storage. Wilson's hammock is just out of frame on the left. The right side of the desk is for school work. As you can see, the coke cans have formed a small breeding colony and are multiplying on their own. The slide out keyboard tray, below the computer, is where I do all my pattern designs on graph paper, the old fashioned way. Once they are in progress I pin them up on the cork board. The trunk contains miscellaneous craft supplies, tools, and hardware. The clear tote on top is my sewing box. The clear rubbermaid tub under the left side is main fabric storage, plus what's piled on top. Moving around the room to the left, next comes my design wall and textbook storage. As you can see, no progress has been made on the "Couple of Squares" quilt. Next to that is my cutting area and the second desk with cat food and water on top and Wilson's actual bed underneath. Yes, it's a vintage suitcase with a pillow inside. He likes it. He sleeps there as long as I'm not doing something he could be interrupting :-) My cutting mat, rotary cutter, and rulers are on the floor there. This area of the room is also host to the empty water bottle colony. I swear I do clean up weekly, but they build up so fast! The prints on the wall are from John Clark and I absolutely love them; you should check him out. Lastly, organized scraps and UFO storage in the top of the closet. There are several boxes of strings sorted by color as well as a box of triangles and one of crumbs. So that's it. The only other thing in my room is a bed. I know that my place is a far cry from the sewing studios I've seen posted on the blog world, which is part of the reason I wanted to share it. I know that in life there will be a lot of small apartments and less than ideal situations. This is where I am right now, and I'm making the most of it. I prefer to think of it as "cozy" :-) Tune in tomorrow for the reveal of the completed bargello top! So here is tonight's freshly ironed progress. There are still two rather wide borders to be added to this and it's already huge! These pictures were taken with it draped over my full size bed, and as you can see, I had to offset it in order to get the border in the picture. Wilson loves more than just about anything to be right next to me when I work and soak up the heat of my desk lamp. This causes problems, of course. If you've ever leaned over a cat to reach your sewing machine you know what I'm talking about. I was thinking one of those cat windowsill seats might be a good solution, but of course I'm too cheap to buy one. So yesterday in between projects I made this: a kitty hammock. It's a simple sling that extends off the side of my desk. The fabric is removable so I can wash it. He seems to approve. Those are strips for my bargello quilt lying next to him. I have them all cut now and the first 3 of the second half are sewn together. Meanwhile, progress continues on the Couple of Squares quilt. I am working out this pattern and the cut requirements as I go so the blocks get progressively better from left to right across the top. Hopefully the rest of it will go smoothly and this can be the bottom when I'm done. Okay, so I wasn't completely good. Here is the progress that's been made on the Couple of Squares quilt. This pattern is really a lot more complex than I expected. The first 2 blocks have involved a lot of unsewing but I seem to be hitting my stride now. The biggest challenges are cutting the diagonal strips to the right length and making all the diagonal squares points line up. When I make mistakes I'm having to piece what I need together from the tiniest scraps because I'm going to need all 40 strips and will use almost all of each strip. I think this is going to be one of those slow and steady kind of projects. I'm absolutely working at capacity between my thesis, job, and class, unfortunately, there's no time for quilting. Believe me, it's not easy to make myself focus on the things I have to do instead! 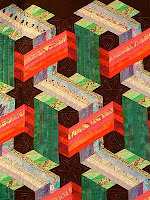 I am still piecing on the bargello quilt. I'm thinking of naming it La Alhambra - after the famous fortress in Granada, Spain - because the curves remind me of traditional Arabic architecture. I've been researching and sketching intricate, geometric, Arabic patterns to quilt in the borders. I'm going to use something like this for the outtermost border. 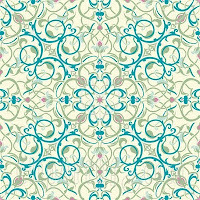 While searching for potential quilting patterns I came across this image, which gave me an idea for my next piecing project - a jelly roll quilt that will use to Arcadia roll I've been hanging on to. I worked out most of the measurements and the piecing (on paper anyway). I'm trying very hard to take notes about the exact cut requirements and piecing so that I can eventually turn this into a pattern that other people can use, rather than my usual guess and go method. Although eyeballing it works well for me, it is hard for someone else to replicate. So, if I behave myself, there should be no new quilting progress until at least Wednesday night. Until then, the new project - tentatively titled "Couple of Squares" because of its resemblance to a squared off Irish Wedding Ring quilt - will have to stay in the state you see above. Wilson, of course, is feeling no stress. Ah, the life of a cat. He doesn't know how good he has it.